For the 2nd time in the last 3 DK Opens, fowlmouth is a champion again! 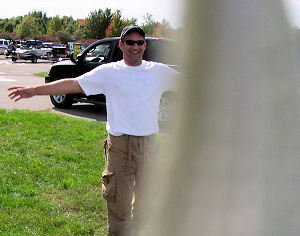 This time fishing with me - djkimmel - in the 2007 Fall DK Open today (9/29/07) on Lake Ovid. fowlmouth becomes only the 2nd two-time winner next to Jason-MadWags (who we feared all day, but ended up not being able to put together his frog bite again)!! fowlmouth pulled out our last keeper with one minute to go in front of spectators less than 70 feet from the boat ramp AFTER having a freak break off on another keeper minutes later losing an expensive frog, and my missing two others during the same time. Our 5 bass went 9.86 pounds with a 3.37 kicker. It was a beautiful day, weather-wise and the bass were biting pretty good albeit scattered in much heavier greener shallow weeds than we normally have this time of year. The challenge was the bass were biting 'shy.' fowlmouth had 9 solid bites on slopwater baits were the bass barely got the tails or missed completely!! Meanwhile, with my ease of boredom, I was changing up lures a lot and getting less strikes, but managed a keeper each on a Chatterbait, Texas-rigged lizard (my first keeper ever from under the bridge) and a Horny Toad. I also lost, missed or broke off several deep fish and finally caught my annual token Northern Pike while VinceR and MIBassKid witnessed. fowlmouth finished out our limit when the bite actually slowed for us, but the bass were finally taking the baits into their mouths better. One keeper took his bait about 6 feet from the boat while he was dead-frogging it (okay, I was distracting him with some silly story or another). We had a much better weigh in than last time at Ovid although many of the 16 competitors mentioned a slow or tough bite. No one was completely skunked though the other pre-tournament favorite - VinceR and MIBassKid decided to spare their one small last minute keeper the weigh in. The pressure may have been just too great for past DK Open Lake Ovid champ Jason-MadWags and local favorite VinceR when considering the lucrative payout and fabulous prizes available? Don't know, but maybe they'll pipe in? Proving it wasn't completely necessary to be a local on Lake Ovid was 2nd place team cfruel and Fiker50 with 3 beautiful bass weighing 8.14 pounds - looked almost like triplets (sorry I caught your bridge bass, but I've been trying to erase that jinx for years!!). 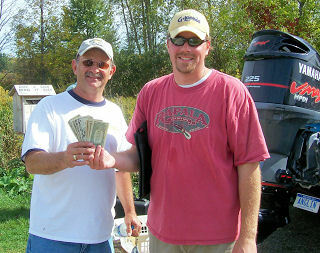 Bender and Hooksetter cruised into 3rd place with 3 nice largemouths weighing 7.92 pounds including the big bass award of the 2007 Fall DK Open - a solid 3.87 pounder caught by Bender. 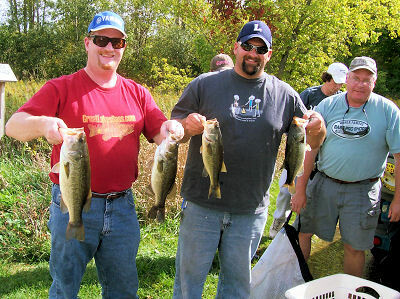 Durand Dan and Ryan tried to meet the challenge with 3 bass for 5.08 pounds. The bite was different and most competitors reported things didn't really start happening until the last 1 to 2 hours of the event. MadWags had a rough morning until mojo kicked in, convincing him there ARE NO SMALLMOUTHS IN LAKE OVID!! Once they buckled down and went after largemouth bass, they managed 2 for 4.48 pounds including the official 2nd big bass of 3.13 pounds. MadWags received a really nice Xtreme Bass Tackle/Combat Fishing packet of 5" X-worms and a O-Wacky tool for the feat. Rounding out the field were yukonjack2 and past Ovid champ Jason-MadWags with 2 bass for 3.32 pounds, stackenem and traveling champ dashaver63 with 1 bass for 1.76 pounds and the only goose egg - VinceR and MIBassKid - a previously hot team, but I do trust MIBassKid when he says they had a keeper and decided not to weigh it in an admirable conservation gesture. So no skunks this time on Lake Ovid. Re: fowlmouth is DK Open Champion once again! Teams up with djkimmel for win. yukonjack2 takes the 2007 Fall DK Open 'Ranger Cup' award as the next highest finishing Ranger Boats owner - winning a quality new Ranger cap! 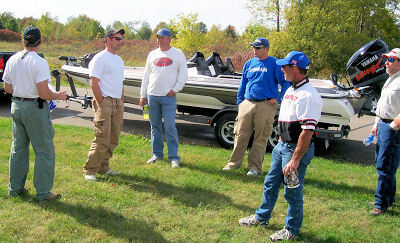 Fall 2007 DK Open participants await the tally of the scores to see who gets the lucrative prizes and cash!! One top secret task I set upon my 'official' photographer Fiker50 was to 'capture' the much sought after mysterious secret preparation techniques of mojo... an admirable effort, but mojo was too good for us, avoiding full disclosure of his secret methods - here is the closest anyone has come so far to catching the secret!